What Makes the Clave Son Such a Good Rhythm? 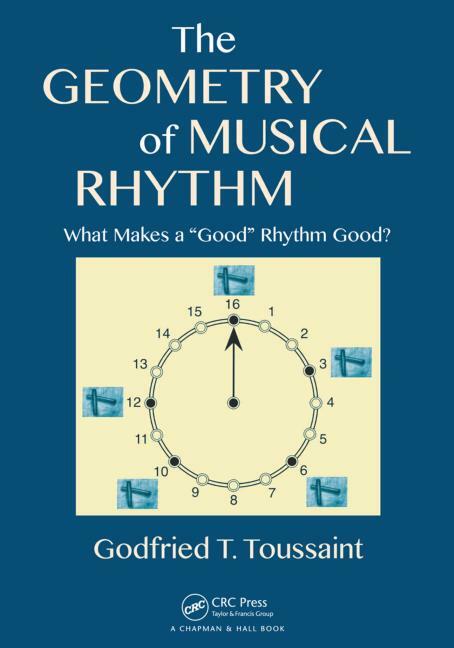 "Toussaint’s Geometry presents a whirlwind tour of the world’s rhythms … For a reader interested in musical rhythm, Geometry is a great introduction to the computer science and mathematics of rhythm. For a reader interested in algorithms and mathematical reasoning, the musical focus provides compelling examples lying at the intersection of the arts and the sciences. … Toussaint is an excellent guide." "This book is written in a leisurely exploratory style and can be used in [a] wide range of undergraduate and graduate settings. … The book can also be used if your field overlaps with discrete mathematics and you wish to explore some unsolved real-world problems [or] if you just want to read an enjoyable mathematical text. … Its math is simple, its applications deep, and it shares the beauty of music. … filled with simple, advanced, and cutting-edge applications of discrete mathematics. … This dynamic fluid presentation of mathematics is exactly what our undergraduate and graduate students need. … I would highly recommend this book for everyone." "… a science-based explanation that begins with the definition of ‘rhythm,’ ‘beat,’ ‘meter,’ and more, then proceeds with the classification of rhythms, the isomorphism of rhythm and scale, syncopated rhythms, thorough a complete analysis of rhythms and rhythm combinations. Of special note is the chapter focused upon the ‘Evolution and Phylogenesis of Music Rhythm.’ A work of seminal scholarship, exceedingly well presented with illustrative drawings by Yang Liu, The Geometry of Musical Rhythm is enhanced with an epilogue, an extended list of references, and a comprehensive index, making it very highly recommended for professional and academic library musicology reference collections and supplementary reading lists." "Toussaint leads us across the globe on the track of some of music’s most powerful and resilient rhythmic patterns. Along the way, we’re treated to many marvels — musical and mathematical. This is a book full of ideas and suggestions for further experiments in thinking. It is an invitation for mathematicians to try their hands at unraveling the puzzles of musical time patterns and an invitation for musicologists to explore the widest range of current quantitative methods." "In The Geometry of Musical Rhythm, Godfried Toussaint takes the reader on a dazzling tour of rhythmic and mathematical structures, from the beat of the Cuban Clave Son to the music of Steve Reich, and from the atomic structure of crystal lattices to the arrangement of radio telescopes. Grounded in his hands-on experience as a percussionist and training as a computer scientist, and using six ‘distinguished timelines’ from African and Afro-Cuban music as musical touchstones throughout the book, Toussaint explores a wide range of mathematical and geometrical tools and concepts to unpack what makes these rhythms distinctive, ubiquitous, and beautiful. Along the way we learn just what makes a rhythm ‘rhythmic,’ how many different rhythms there are (as well as how many are actually used), how we might judge rhythmic similarity and difference, and how rhythmic patterns and practices may have evolved and migrated over time. Toussaint serves up his observations and analyses in bite-sized chapters, making both the mathematics and the music accessible to a wide readership, whether they are professional musicologists and mathematicians or simply anyone who has ever been fascinated by the swing and syncopation of rhythms from around the world." "The Geometry of Musical Rhythm sets new standards for scholarship on musical rhythm. Ranging across numerous world repertories, Godfried Toussaint captures the geometrical underpinnings of a variety of rhythmic patterns and in so doing, helps us to see, hear and feel them more intensely. No other book brings the properties of rhythm into such sharp focus while encouraging debate about what makes one rhythm good, another bad; what underlies perceived similarities between rhythmic patterns; and why one rhythm might be complex while another is simple. Toussaint’s fascinating book shows why rhythm is at once the most fundamental and yet elusive of parameters." "The Geometry of Musical Rhythm is a refreshingly accessible exploration of rhythms that have been performed around the world and throughout history. Toussaint, a renowned mathematician and an amateur percussionist himself, has read broadly and reflected thoughtfully about ways in which rhythms can be described, categorized, and compared. The centrepiece of his discussion is son clave, which Toussaint traces from 13th-century Baghdad to its recent role as a truly global rhythm that has been prominent in such popular idioms as rock and salsa. Starting from very slim premises, Toussaint explains dozens of mathematical tools that quantify selected aspects of rhythmic simplicity and similarity. These measures result in phylogenetic trees that specify the extent to which certain rhythms are structurally close to one another. Especially valuable in this regard is the precision with which Toussaint applies contrasting formulations of ways in which music can change. On one hand, those whose mathematical experience is limited to what they learned in high school will be able to follow Toussaint’s graceful exposition quite readily; on the other hand, specialists in adjacent areas of the sciences, psychology, and ethnology will discern suggestive avenues of research far beyond the fundamental approach to musical time that he unfolds in many short, easily digested chapters."